Automobile and truck repair at the Bailey Brothers Collision Repair location has been part of Brookfield and surrounding communities in north central Missouri for more than 30 years. 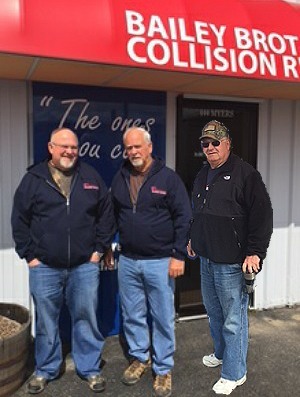 In 2000, the Bailey Brothers -- Bill, Danny and Jerry, born and raised in St. Catherine, returned home to purchase the collision repair company from Smith Motor Company. Danny and Bill had built careers in the collision repair industry and were looking to reconnect with their boyhood communities. Bill, the managing partner, was raised in St. Catherine and moved to Kansas City in the mid-1960s. In 1965, he opened A & B Collision Repair in Riverside, Missouri. Danny soon left the farm and came to work at the Riverside location in the late 60s. In 1990, Danny and Bill opened a second collision repair facility in Smithville, Missouri. (From Left to Right) Danny and Bill Bailey, both lifetime members of the Society of Collision Repair Specialists Hall of Eagles, and brother Jerry, who owns the family farm in St. Catherine. As the 90s came to an end, the three brothers were looking for investment opportunities back near St. Catherine where Jerry, known locally as 'Beetle,' still owned the family farm. In 2000, the Bailey brothers had the opportunity to purchase the collision repair center at Smith Motors. In making the purchase the brothers were able to hire Herby Fessler, as the manager of the new enterprise. Herby continues to manage the day-to-day operations of Bailey Brothers Collision Repair.